Photographer Roger May was born in the Tug River Valley on the West Virginia/Kentucky border. His soon-to-be published "Testify" is, he says, "a visual love letter to Appalachia, the land of my blood. This is my testimony of how I came to see the importance of home and my connection to place." The Bitter Southerner is proud to bring you a broad cross-section of May’s work with a bonus, the foreword to “Testify,” penned by the great Kentucky novelist and journalist, Silas House. When I was a little boy growing up in Southern Appalachia my family attended a small Holiness church where poetry fell out of people’s mouths when they rose from the hard wooden pews to testify. They revealed their joys and sorrows. They sought forgiveness. But most of all they told their own stories. Because they were Appalachian they had a particular way of expressing themselves. They spoke in a rhythm that mimicked the way stripes of mist ease over the ridges on summer mornings. Their words were so vivid and perfect, they seemed to have been carefully chosen. But for them, telling a story was innate. They were born with the ability to testify. We take words seriously in Appalachia. We have a deep reverence for language and storytelling. So it’s no surprise that testifying is seen as a sacred act for many people of the Southern mountains. But testifying does not only take place in church. The act of telling one’s story might be holy, but it can be done anywhere. In Appalachia, we tell our stories not only on front porches and around kitchen tables but also in the aisles of the local Walmart and the waiting rooms of hospitals. We tell tales in our gardens while we hoe beans or far back in the deepest coal mines. Often they are stories of nostalgia, for we are a people always mourning the past. Always holding tight to the old ways, grieving because we know how easily things can slip away forever. But just as often our stories are rooted in the modern world and told in increasingly modern ways: on laptops, blogs, social media, digital cameras, in texts and videos. The thing, always, is the story. The beauty is in the testimony itself, even when there is ugliness mixed in, too. In these mountains we know what it’s like for the eyesore and the magnificent to coexist. The true beauty is in that complexity. May is from these mountains and he has given us the testimony of a people and their way of life through these photographs. Best of all, he has done it with complexity. Compassion, yes. An insistence on not looking away, yes. But complexity always. For the past 100, photographers have been telling the story of the Appalachian people. Photographers like Doris Ullman revealed the region’s dignity in her beautiful portraits of people with their musical instruments or tools of trade. Traveling photographers went door to door to take pictures of families for pay, preserving a way of life that today shows the region as a place that was behind the times for some and very much of the latest styles and conveniences for others. Since the 1950s images of Appalachia have mostly been captured by photojournalists who often picked the most sensational subjects. During the War on Poverty only the poorest folks got into the newspapers and magazines, perpetuating the stereotype that everyone in the Southern mountains was barefoot, malnourished, dirty-faced. Both outsiders and native artists continue to perpetuate those notions of depravity today. Others insist on only recording the amazing physical beauty of the region, even if that topography is disappearing more and more each day. But romanticizing a place is just as bad as vilifying it. Roger May insists on doing neither. May’s Appalachia is a place so rooted in tradition that a man still cares enough about the graves of his ancestors to carefully tend them, but does so dressed in the decidedly modern outfitting of an Appalachian man: flip-flops, shorts, a Jesus t-shirt, and a camouflage cap. A place of wrecks on the highway and flat footers dancing in their living rooms, young couples courting on a truck tailgate. May preserves the intimate moments: a strong mountain woman—hair coiffed in a perfect white bun—finding a recipe in her spotless kitchen, the simple grace of leaf-filtered light falling through curtains decorated with roosters, the strangeness of a pale plateau of mountaintop removal standing like a wide tombstone over green hills. Each of these images tell a multitude of stories. They offer May’s testimony, but it is our story he is telling, too. Because we are all Appalachians, all people who desire to be told a story and hoping for our own to be heard. In these photographs May presents our place in all of its perfection and imperfection, grime and purity. In all of its wonderful complication. 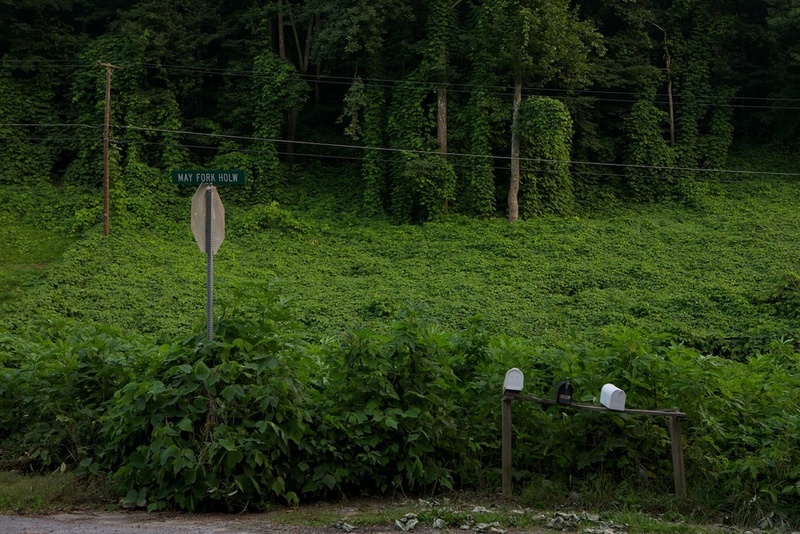 "Testify" is a visual love letter to Appalachia, the land of my blood. This is my testimony of how I came to see the importance of home and my connection to place. After moving away as a teenager, I’ve struggled to return, to latch on to something from my memory. These images are a vignette into my working through the problem of the construction of memory versus reality. My work embraces the raw beauty of the mountains while keeping at arm's length the stereotypical images that have tried to define Appalachia for decades. The word "testify" carries both a religious and legal meaning. In the churches of home, it's common for a portion of time during a church service to be devoted to allowing members to share publicly what God has done in their lives; to give their testimony. In legal terms, one’s testimony is a statement accepted, sworn under oath, believed to be true and acceptable. I am both an insider and an outsider and though I maintain a safe distance in my photographs, I attempt to invite you into the intimacy of family, of sacred space. "Testify" is my bearing witness of a personal journey, of never truly being able to go home again, to seek answers from my ancestral home. Appalachia testifies of timelessness and natural beauty. The mountains testify of protection and sanctuary and at the same time the horrible destruction of mountaintop removal mining. The people of Appalachia testify of their pride and resilience. Old-time religion testifies of the power in the blood and a heavenly home just across the shore. Black lung disease (pneumoconiosis) is an incurable lung disease caused by prolonged exposure to coal dust. It has killed more than 9,000 miners since 1999. My paternal grandfather, Cecil May, died from the disease when I was 15, as did two of his brothers. Rather than being on the decline, black lung is on the rise, particularly in younger miners. Many retired miners, folk who have spent decades underground risking their lives to power the nation, now find themselves fighting insurance companies and coal company doctors to get the medical benefits they deserve. I'm fascinated by these miner decals, which range from the straightforward to the humorous. Some even imbue overtly sexual connotations. All are an outward declaration, a statement, of miner pride. In June 2010, my dad gave me my grandfather's "dinner bucket" from his time in the coal mines. My grandfather, Cecil May, worked in the mines for 41 years after serving in the Navy during World War II. The Rev. Harrison Mayes was a coal miner from Middlesboro, Ky. While trapped in a mine, Mayes made a promise to God that if he let him live, he would spend the rest of his days spreading his word. The Museum of Appalachia in Clinton, Tenn., has a rich exhibit about the life and work of Mayes. This sign, in Maher, W.V., is one of countless signs placed by Mayes in more than 40 states. My grandfather told me that I have two ears and one mouth, which means that I should listen twice as often as I speak. Through these images, I’ve tried to do just that — to listen more than I speak, both with my voice and my cameras. These images arise out of my pride of where I am from and where I am of, and an enduring love for Appalachia. Roger May's collaborative photo project aims to document Appalachia 50 years after President Lyndon B. Johnson declared the War on Poverty.